Call me stubborn, but I absolutely refuse to patronize the restaurants in Basel. Every time I've tried them, I've found them overpriced, with poor service and mediocre food. Rather than complain endlessly on here, I've voted with my wallet and now do my dining over the border in neighboring France or Germany. It seems others are equally frustrated. So I thought that it would be a good idea to start a consolidated list of restaurants on this thread that other EFers recommend, across the border but close to Basel, for those of us who prefer to get a little better value-for-money than what's available here in Switzerland. So let's hear it -- where should we be eating in St. Louis, Huningue, Weil-am-Rhein, and Lorrach? Any hidden gems that we should seek out? Last edited by Village Idiot; 10.10.2012 at 17:46. This restaurant receives mixed reviews on TripAdvisor, but I don't really understand why. Every time we've been to the restaurant, we have received a warm welcome from the waiters/waitresses and the service has been top-notch. A number of them have been here as long as we've lived in Basel, and I assume that they are either family/owners or career-long waiters. The décor is very twee, but this is Alsace and that's to be expected. Weekend lunchtime here is very popular and booking is nearly always required; dinner time is slightly less busy and there usually isn't a problem getting a table without a reservation. The menu here changes seasonally, but is always Alsacian. If you are looking for a typical French bistro, you will probably be disappointed, but if you are in the mood for a good choucroute garnie (sauerkraut with sausages and ham) then this is the place. Other favorites of ours are the jambonneau (slow-roasted pork) and the boeuf gros sel, crème au raifort (the French version of a tafelspitz – boiled beef served with vegetables and horseradish cream). For something lighter, my favorite is the Tartine Paysanne (toasted bread served with bacon, onions, mushrooms and a salad) . For the more adventurous, the first half of the menu is made up almost entirely of bits of the animal they don't eat elsewhere – pigs' feet, os-a-moelle (osso bucco), veal head, kidneys and andouillette. If you don't know which bit of the animal you're eating and you're the least bit squeamish, ask before ordering! following on from this post Would it kill the restaurants here to give you free water please add your list of restaurants that are in the surrounding german / french areas of basel - NO RESTAURANTS IN SWITZERLAND. Please only add restaurants that you have been to and would recommend to friends. excellent! classic style, with set and normal menu. reservation essential. also excellent with great views, set menu specials change every few days. reservation essential! ask for a table by the window to enoy the views. Can be a bit tricky to find as its set up on the hill. GPS directions normally direct you thru a no entry road - look for alternative route. http://www.elgaucho-loerrach.de/ argentinian steak house, take the beef fillet - super soft. Also offers lamb. reservation recommended, 7 mins on train from Basel. http://lotus-loerrach.de/ chinese restaurant, not bad at all, decent amounts of food and reasonable prices, next to the border and a few mins from tram stop. reservation recommended. - is "ok", some people rave about it, food was good but service so so. near tram 10. DO NOT sit at the back of the room in the alcove near the big mirror, you will be waiting ages for any service and confirm your reservation, they sometimes forget to enter it in the book! http://www.restaurant-starck.com/ not bad traditional meals, but next to a farm so flies are around all year. Famous for an "obelix" steak but it quite small in reality, steak is better at gaucho in lorrach. excellent in all aspects but pricey. very very good, reservation essential. some have mentioned the viamichelin links dont work, i found it doesnt work with iphone/tablet etc but have added the direct homepage links also. Last edited by rob1; 11.10.2012 at 10:01. I have written about this place before on English Forum, but since my first post, we have been back many times. I lived a long time in France before moving to Switzerland, and in my time there, I discovered two things: first, that I really love Vietnamese food and second, that I really do not like the French interpretation of Chinese food. Curiously, I cannot seem to find a decent Vietnamese place on the French side of the border, although there are a couple of Chinese places and a Japanese restaurant in St. Louis. But across the border in Germany, Hanoi Quan serves excellent Vietnamese food (and passable Thai & Chinese food, better than its French counterparts). The family that runs it is Vietnamese, but they serve Thai, Vietnamese, and Chinese food. It's not all 100% authentic, but it's better (and a lot cheaper) than anything I've found on the Swiss side of the border. The Vietnamese and Thai food are particularly good, while the Chinese food has been more tailored to the German palate and locally-available ingredients. No buffet, but plenty of good choices on the menu. From the Vietnamese menu, the Pho Bo is good – although not as good as what I used to get when I was in Paris. The Bun Cha Nem is excellent, and is what I normally order. The Chinese offerings tend to be predictable (oyster sauce, sweet-and-sour, etc) but the portions are very large and there is usually enough to take home. At lunch (including Saturdays) there is a lunch menu with about a dozen choices including a soup or spring roll, main course and rice for about EUR7. This is one of those restaurants that reminds me of what I used to have back home that's really lacking in Switzerland -- authentic ethnic cooking without a load of frills, but where I can eat for under EUR15- per person including drinks. I never have to think about budgeting for a meal out at a restaurant like this, whereas shelling out at most restaurants in Switzerland can be seriously damaging to your wallet. For those of you who get a craving for sushi and want to indulge without breaking your wallet, I offer you a short review of Fuji Sushi, in St. Louis. There are the ubiquitous gyoza, meat/seafood skewers (brochettes, a French creation that is very distantly related to yakatori), sweet cabbage salad and sweetened soy sauce (regular is also available). 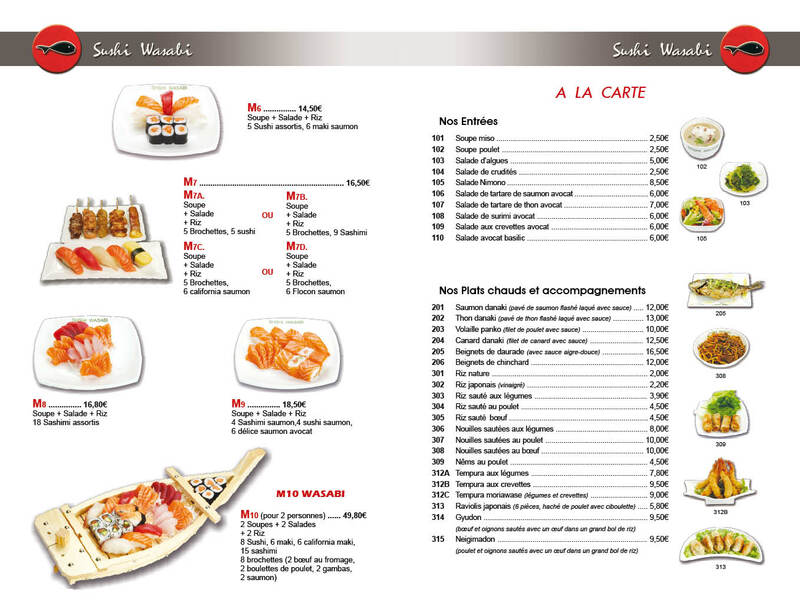 Most items are available as 'menus' with soup, salad, and various combinations of sushi/sashimi/brochettes. So, having done the level-setting and warned you that this isn't Tokyo, on to the review. A menu with soup, salad, and a plate of 10 Nigiri (3x salmon, 2x tuna, 1x mackeral, 1x sea bass, 1x egg (tamago), 1x fish roe, 1x shrimp) cost a very reasonable EUR16. The fish was fresh, but not terribly well-prepared. The nigiri pieces were too large, in particular the pieces of fish. Still, I went in with limited expectations and came out pretty happy. It wasn't terrible, it satisfied my sushi craving, and I left with a full belly and a full wallet -- pretty much the opposite of my sushi experiences on the Swiss side of the border. This is definitely one of the classier restaurants on the French side of the border, with a really nice ambiance inside. It is much more modern than any of the other restaurants we’ve tried in the area, and feels much more like something you would find in a larger French town (or in Basel). The menu is something of a mix of traditional French bistro classics (salad with chevre, steak-frites, etc) and some fusion cooking with a regularly changing daily menu in addition to the a-la-carte menu. Starters/desserts are around EUR7-10, with main courses between EUR15-20. There’s a good wine list as well featuring many local (French) wines. Our only disappointment in this restaurant is that we’ve twice been served by the same waiter who was either 1) completely drunk or 2) completely cuckoo. It was less about serving us and more about harassing us (‘no, you can’t have your steak cooked any more than rare’), interrupting our conversation to offer his opinion on one thing or another, or forgetting our order / table altogether. Luckily he had a more junior counterpart who seemed both more-capable and long-suffering. I don’t know if this guy is the son of the owner or whatever, but it certainly detracted from what otherwise was a very nice place. Absolutely great restaurant, our favorite. The menu they have on offer is fantastic value-for-money. For 30 EUR you have a great menu, that includes starter, main dish and desert. Every single dish is excellent; and the owners are friendly. Place looks slightly upscale, but the prices are extremely reasonable. Around 25km away from Basel. We have even cycled there once, beautiful trip. Eaten there a couple of times and had many, many coffees and cakes there. Always Saturday lunch time. Always excellent. It's a regular part of my "St Louis Farmers Market" cycling trips which I arrange when it's warm. Never let it be said that my reviews only cater to the top end of the market. I like a good, greasy fast-food burger as much as the next man, but I refuse to pay CHF12+ for an extra value meal at the Golden Arches in Switzerland. As something of a connoisseur of McDonalds, I highly recommend the one in Weil-am-Rhein. Sadly, you won’t find my favourite sandwich there (the Charolais burger, with emmental cheese and peppercorn sauce) – for that, you’ll have to go to the rather shabby McDonalds in Saint Louis. Nevertheless, I recommend the one in Weil-am-Rhein. Not only does it have the normal range of McDonalds’ menu, but it has a much wider variety of promotional menus / seasonal sandwiches than the French counterpart. There’s also a McCafe in this branch. And there’s a strong management team here – the food actually looks like it does in the photos, the restaurant is immaculately clean, the décor is all brand-new, and the staff look genuinely happy to be working there. If you’re a value-minded customer, it’s always worth check the McDonalds’ website to see if there are coupons. It seems that there’s always a 2-for-1 offer on. What can I say? This is a favourite on the English Forum, and no list of restaurants near Basel would be complete without it. Another one that falls under the 'too-lazy-to-cook' category. If you fancy an American-style pizza but don't want to pay CHF30- for it at a Swiss branch of Dominos, head over the border and pick one up (it's take-away only) at this branch which is located inside the Geant shopping center. It's usually about EUR8 for a medium pizza with reasonable toppings. I grew up with Pizza Hut and a 'Meat Feast' is still my favorite thing in the world, but Dominos is about as close as you get in this part of the world. Yes, it'll make purists cringe, but it satisfies a little nostalgic piece of my heart. Important to note that this Dominos closes at 7pm, an hour earlier than the main shop. There's an additional Dominos in Hesingue but I've never tried it personally. I really like La Couronne d’Or. From the outside, it’s nothing special to look at and you would likely drive right past without giving it a second look, but inside it’s a different story. With a mixture of long tables for big groups and smaller tables, it right away tells you its purpose: this is where families gather for a Saturday or Sunday lunch. In warmer months, ask for a table on the glass-enclosed terrace at the back of the restaurant. The menu is seasonal, and changes every couple of months. Food is very typically French with a real emphasis on fresh ingredients. There’s a good a la carte menu, and a four-course ‘Menu Surprise’. We were going to order the ‘Menu Surprise’ but were put off by the waiter – apparently it’s something designed for the Swiss customers and features a rather bland meal tailored to their tastes. On their advice, we always order off the a la carte menu and have never been disappointed. They also have a good wine list featuring a large selection of French wines (from all across France) as well as several pages of local Alsacian wines. Portions are enormous, and the food is always well-executed. Dishes that sound very simple on the menu come out with much more sophistication than you’d expect. The restaurant is loaded with Swiss (probably upwards of 70% of the clientele is Swiss), and at least on weekends, reservations made several days in advance are absolutely essential. Downsides? They don’t seem to have the pacing of the reservations down properly, so lots of tables will arrive at once, meaning long waits for food. And although there are always four or five servers floating about, more often than not they’re found huddling behind the bar and talking to one another. You always get the sense that the kitchen is overwhelmed with the orders. The last time we ate there, our starters came out within ten minutes, but it took a further hour before anyone came to clear the plates away, and another half-hour beyond that for our main courses to come. If you’re out for a lazy Sunday afternoon and aren’t bothered (or starving), that’s OK, but if you’re under any time pressure at all, it’s really annoying. Part of this could be that we tend to eat later than the Swiss, so we might always get stuck at the back-of-the-queue. But it’s been pretty consistent -- it always takes a long time for our food to come out. Still, despite the poor service and slow food delivery, this is a restaurant we keep returning to. It’s got just the right relaxed vibe for a weekend lunch or dinner. Last edited by Village Idiot; 10.10.2012 at 21:32. By German standards, it was a little expensive at EUR15 for a starter and EUR25-30 for a main course, but the standard of cooking was superb. This is a place that focuses on the big classics and executes them really well. The service was good, too – they were very patient with our poor German, and the maitre d’hotel came around frequently to make sure that everything was just right. He also controlled every dish that left the kitchen, and I saw him turn at least one plate back as it didn’t meet his standards. The downside (not readily apparent from the photos on the website) is that the ambiance and décor is a trip down memory lane to early 1980s Germany. Don’t get me wrong – everything was in perfect order and immaculately clean, white tablecloths and napkins starched and silverware/glasses perfectly polished. But the entire restaurant is decorated in dark brown, with brown tiles and dark wood everywhere. They’ve decided to try to save electricity and use harsh, fluorescent overhead lights, and the whole place just comes across as kind of drab. My wife commented, as we walked in, that it looked like we were walking into a 1970s hotel breakfast room. And we were definitely the youngest clientele by 20 years – this is a place that appeals to the older diner. A shame, really, because that aside, I couldn’t fault a single thing about the meal. With an interior modernization, this could be a really great place. If you love good food and can overlook the slightly dull interior, this place is worth a visit. Last edited by Village Idiot; 11.10.2012 at 12:48.
if no one objects can a mod remove posts 6,7, 8,10 and this one to clean it up after the merge? Okay, this is another one that doesn't technically qualify as a 'restaurant' but is a great option for those who don't like to cook. I've used Eckert to cater parties in the past and have been very pleased with them, but I only learned recently that they actually have a good selection of 'ready meals' that change daily. These are actually freshly-prepared meals that are made fresh each day and simply need to be reheated at home. One of the things I miss about the UK was the 'fresh' meals that used real, uncooked ingredients but didn't require any additional preparation -- Tesco's Finest Range and M&S used to do quite a few of these. Here, you seem to have the choice of a 'ready meal' (fully cooked, loaded with salt and chemicals, all the flavour and appeal of cardboard) or fresh ingredients that you need to assemble yourself. The traiteur is a good compromise -- the convenience of a ready-meal, but the quality and healthfulness of fresh food. There are menus available online each day, although there are usually 6-7 offerings available in the shop. Prices are generally EUR7 per person. However, did any one try http://www.tchopan.de/ ? Want to know if its a good restaurant or not. This is an absolutely typical French-Chinese restaurant, notable mostly for its proximity to the border (and very handy for take-away if you work at Novartis). You get the normal selection of beef, pork, chicken or duck stir-fried with onions, peppers, mushrooms, or bamboo, all covered in a relatively bland sauce. In that sense, it represents everything I dislike about Chinese restaurants in France -- they're about as authentic as pineapple on a pizza. But it's cheap enough (main courses around EUR8) and very handy for nights when you don't feel like cooking. Call in your order as you walk out the door, and it'll be waiting for you ten minutes later. To their credit, they're used to people coming over from Switzerland. I paid for my EUR15 dinner with a EUR50 note, which is the smallest that my bank's ATM spits out. Elsewhere in France, that would provoke a sharp intake of breath and some tut-tutting, but here the large note was cheerfully received. In summary, I wouldn't head to this place for fine-dining, but for cheap takeaway, it's got its place. when did you last go? we stopped going many many years ago as it was well "nasty"